We love how ‘Trove’ perfectly captures the thoughtful uncovering of this lost value through the imagery of adventure, discovery, and treasure. Our team has long been enamored with the @ symbol. A stylized fingerprint version of it was the basis of our original company logo-mark. The @ sits at the heart of digital communications. In modern communications, it has come to represent both a person and their online address location. 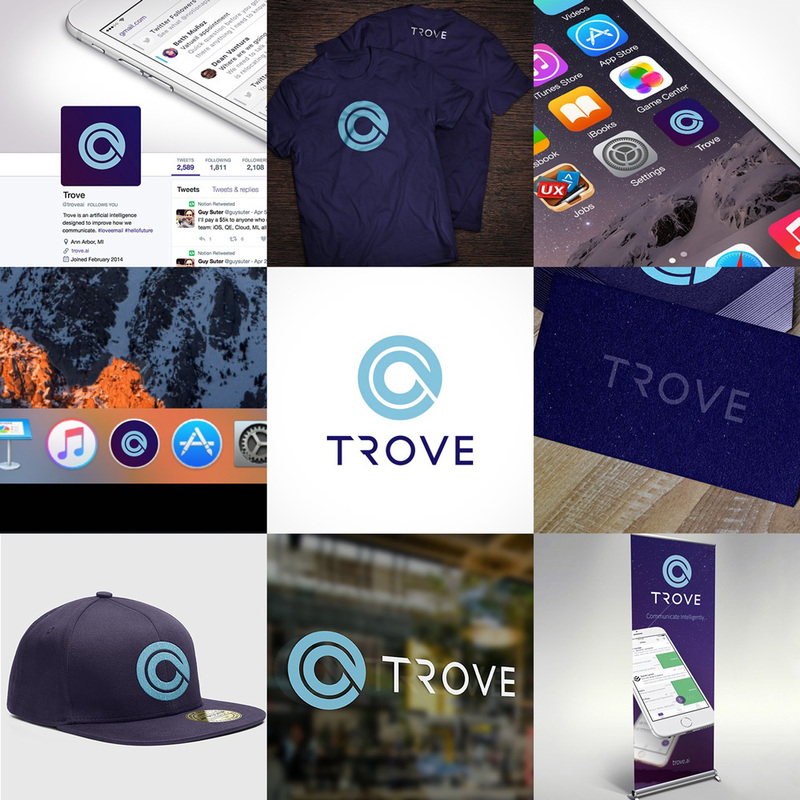 We stumbled on to a beautiful logo-mark for Trove that we love by following timeless design principles. This simple stylized @ symbol delivers a strong and meaningful shape. You could easily see it in the language of some futuristic spacefaring colony. And, as you’ll see below, it still has plenty of potential for a galaxy animation treatment. In a callback to our original visual brand, the Trove logo-type includes a special treatment on the letter “R,” conveying how Trove AI reveals information that was previously hidden. It is subtle but, at least in our minds, the negative space around the “R” also hints at A and i letter forms. Promo video. Lackluster logo animation, which is too bad because that could be the one cool thing about this icon. The old logo had a cute icon of a smiling email and was surprisingly charming; I wish they had kept it. The old wordmark was super annoying with that last “n” hiding behind the “o” because customizing. The old name was as relevant as the new name, which is to say: not very. I mean, Trove is fine as a name, but what it has to do with artificial intelligence is not obvious, or at least not to me, and the lack of relationship extends to the logo, as there is no rhyme or reason for what a stylized @ symbol has to do with it or how a space-age, TRON-esque font pays off of the name. On their own, some of these things are fine and relevant — after all, the @ symbol is the glue that holds together all email addresses — but all together it’s too many disparate things. The execution is decent and they get credit for matching the angle of the @ symbol with the angle of the “TR” cut — not so much credit on the Photoshop job where wordmark meets galaxy. Overall, it’s fine, harmless, and sort of appropriate for the notion of futuresque AI aesthetics but maybe too heavy-handed on its colony concept. Thanks to Sam Schlesinger for the tip. (Est. 2013, previously Notion) \"Trove reimagines your email experience using thoughtfully-applied intelligence while constantly adapting to you. Trove learns how you do time-consuming stuff, like managing your inbox, and relieves your burden. From your history, new insightful relationship and conversation information is unleashed by Trove for the first time.\"